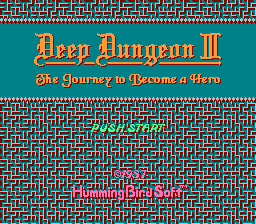 Deep Dungeon III: Yuushi heno Tabi is a role playing game for the Nintendo Entertainment System. 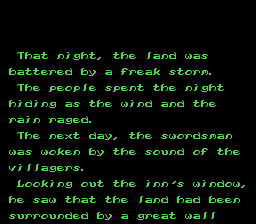 This is a complete translation for Deep Dungeon III. A patcher is included that can expand the ROM to 512KB and apply the IPS patch. (to manually expand, just add 256KB of empty space, and duplicate the last 16KB into the last 16K of that expanded space) The BPS version of the patch should expand and patch the game without needing to expand the game first. This translation also makes some modifications to the game balance. Namely, KingMike didn’t like it that the game decided attack/spell, etc. success rates most of the time on RNG alone, so he made some mods to only use the stat-influenced RNG rolls. 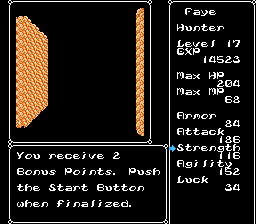 He also took out this really annoying feature where your characters sometimes de-equip their weapon in battle, costing you a turn and then another turn to fix it. 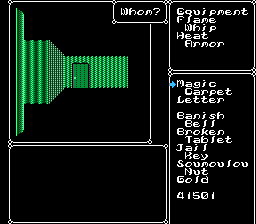 He also fixed a few original bugs, the most serious of all being a bug that can kill your defense whenever you use a spell on your party. For those who insist on a “pure” translation, he left a list of offsets to mod back if you want to have the exact difficulty of the original version. 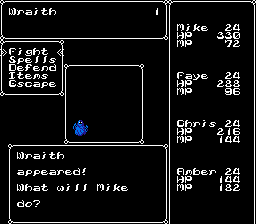 While the translation patch itself has been properly done, KingMike has also included a translation of the manual, a largely machine-assisted job done as a last-minute bonus (the non-story parts more summarized than translated). The custom patcher will expand the ROM, with CRC and MD5 0x68010006 and 0xb8620e5a0041c226a4105e169440090d, respectively.